It really was a heartbreaker. 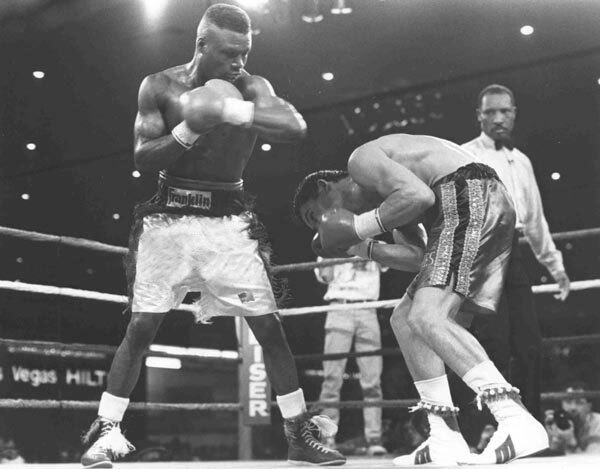 On this day in 1990, Meldrick Taylor fought the most memorable fight of his career and lost his Jr. Welterweight championship by just two seconds. His opponent was the great Mexican champ, Julio Cesar Chavez, and this was a battle of undefeated kings - Chavez the legend against Taylor the young upstart with a gold medal. You just knew it would be a good one - but this was a great one. In the bout, Taylor showcased his speed and punching array to build what seemed to be an insurmountable lead against the slow-starting Chavez. Even as the fight wore on into the middle and later rounds, Taylor found himself in charge - or so it seemed. Somewhere around the 9th round, evidence of Julio's punches started to show as Meldrick's face began to distort. What few punches the Mexican was landing clearly were taking their toll. And when Taylor began to tire and his speed let up just a notch, it was all Chavez needed to make his move. As Chavez surged, the fight came down to just one question - Did he have enough time? If this had been a 15-rounder from the grand old days, there would have been no question that Julio's perseverance would pay off. But this was 1990. Title bouts had been neutered to 12 rounds, and Julio's clock gave him just a few minutes to finish the job. Most fighters in Meldrick's position would have stayed away and coasted to the decision. But Meldrick Taylor never fought that way. What made him so great to watch was that it was always clear that this guy loved to fight. He was there to beat Julio Cesar Chavez, and I guess, felt he had his own job to complete. The fight came down to the end with the relentless and then undefeated Chavez out to make the best of every remaining tick on the clock. His assault was brutal, and Meldrick was feeling it. In Philly, we all watched with a knot in our stomachs as a career-defining fight for Taylor appeared to be slipping away. But the clock was telling us that he was going to make it. It was the 12th round, there were just 15 seconds left. The fight was over, or so we thought. But then suddenly, Taylor was dumped in a neutral corner. He got up but was dazed. Then with just two seconds left in the final round, referee Richard Steele stepped in to save Taylor from punches that Chavez would never have had time to throw. If wearing blinders, the stoppage wasn't such a bad one. But with the knowledge that the fight was basically over, if not technically so, and that Taylor was sitting on a scorecard lead that would have given him a historic victory, the decision by Steele was terrible. It was one of the reasons fans booed Steele for many years to come. To his credit, Chavez showed exactly how tough, patient and truly great he was. After this tough battle where he was on the receiving end for most of the night, Julio's face was unmarked. That wide smile of his told the story. Chavez had chalked up another great victory, his 70th. With it, came Taylor's IBF share of the Jr. Welterweight Title. For Taylor, it was the beginning of the end. Although his record dropped to just 24-1-1 and he went on to win the WBA Welterweight crown a year later, he really was never the same after this bout with Chavez. The pair fought again a few years later, but by then in full decline, Meldrick couldn't hold off Chavez and lost in round eight. Taylor was a fine fighter with a fleeting prime. But that prime displayed brilliant skills and a fighting heart that few others could match. March 17, 1990 was the night Meldrick Taylor both reached his peak and toppled from it. He lost to a better fighter that night, but only by two seconds.